The northern province of Hai Duong has exported about 9,500 tonnes of litchi from the beginning of this year’s crop, according to the provincial Department of Industry and Trade. The department said they shipped about 9,340 tonnes of litchi to China, 120 tonnes to the Republic of Korea, and 40 tonnes to Australia, the UK and France. Besides, the province sold 18,500 tonnes of litchi in the domestic market, including major cities like Hanoi and Ho Chi Minh City, Hai Phong city, wholesale markets, trade centers and supermarkets. According the provincial Department of Agriculture and Rural Development, in 2018, Hai Duong has about 10,500 ha of litchi, mostly in Thanh Ha district and Chi Linh town, which are expected to yield about 60,000 tonnes. Of the total amount, some 1,000 tonnes is qualified for export to the US, Australia and the EU, he said. Currently, 131.68 hectares of local litchi cultivation are qualified for exports to the US, EU and Australia. The province is also home to 334 hectares of litchi grown in accordance with VietGAP standards. The harvest time is from May 15 to the end of June. Hai Duong litchi received the geographical indication from the Ministry of Science and Technology’s National Office of Intellectual Property in 2007. The local fruit was listed in the top 10 quality products in 2013 and 2014 and received the Gold Brand prize in 2015. 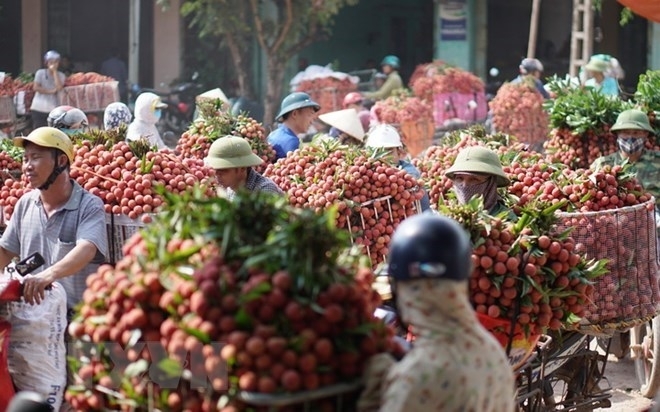 Besides the domestic market, Thanh Ha litchi has increased its presence outside the country. The fruit has been exported to Australia, Canada, China, France, Malaysia, the Philippines, Singapore, Sweden, Thailand, the United Arab Emirates and the United States.